Are we witnessing the final days of the National Rifle Association? That’s what the NRA would have us believe. The NRA has filed suit against New York Governor Andrew Cuomo, the New York State Department of Financial Services (DFS), and DFS Superintendent Maria Vullo, claiming that recent statements and judicial actions related to the NRA’s banking and insurance relationships are politically motivated and intended to cripple the organization. This case is necessitated by an overt viewpoint-based discrimination campaign against the NRA and the millions of law-abiding gun owners that it represents. Directed by Governor Andrew Cuomo, this campaign involves selective prosecution, backroom exhortations, and public threats with a singular goal—to deprive the NRA and its constituents of their First Amendment rights to speak freely about gun-related issues and defend the Second Amendment…Defendants made it clear to banks and insurers that it is bad business in New York to do business with the NRA…Defendants’ abuses will imminently deprive the NRA of basic bank-depository services, corporate insurance coverage, and other financial services essential to the NRA’s corporate existence and its advocacy mission. This claim is based on two major actions by Cuomo, Vullo, and DFS, which the NRA says were partially motivated by pressure from Everytown for Gun Safety, Michael Bloomberg’s nonprofit, and partially by what they say is Cuomo’s career-long vendetta against the NRA. First, DFS investigated the NRA’s new “Carry Guard” insurance program, which offers insurance “to cover legal fees and liabilities arising from self-defense shootings.” (Yes, you read that correctly: If you shoot someone with a legally owned gun and claim self-defense, the NRA wants to make sure your legal bills are covered.) While it’s not unusual for insurance to be endorsed by or offered through a nonprofit, DFS claimed that this type of coverage violated the law and exacted a $7 million penalty from Lockton Affinity, the broker that offered the program. There is a fair amount of precedent in the business world where firms have implemented measures in areas such as the environment, caring for the sick, and civil rights in fulfilling their corporate social responsibility…the Department encourages its insurers to continue evaluating and managing their risks, including reputational risks, that may arise from their dealings with the NRA or similar gun promotion organizations, if any, as well as continued assessment of compliance with their own codes of social responsibility. Dylan Matthews at Vox says that’s baloney. 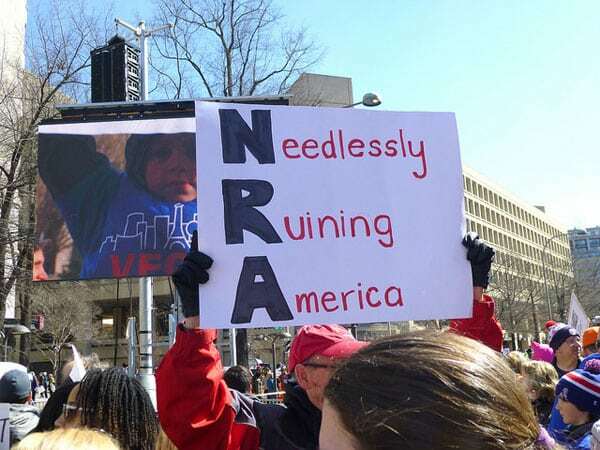 He argued, “the NRA is a mass-membership organization with powerful supporters in the federal government and the business community. A skeptical reader might argue that the NRA is trying to portray itself as more threatened than it really is in order to strengthen its case against Cuomo.” Revenue has been rising steadily, though it’s true the organization lost about $40 million last year. The saga of Lois Lerner’s missing emails drags on even as we head into an election season that may be warped by the IRS targeting scandal.